​LISTEN UP: Australia’s most excellent, slightly slack true-blue rock septet West Thebarton Brothel Party have a real good new single and a tour coming up. Led by charismatic leader figure, gravel-voiced frontman Reverend Ray, West Thebarton Brothel Party's absurd nom-de-plume has catapulted them into bars, bills and best of lists. 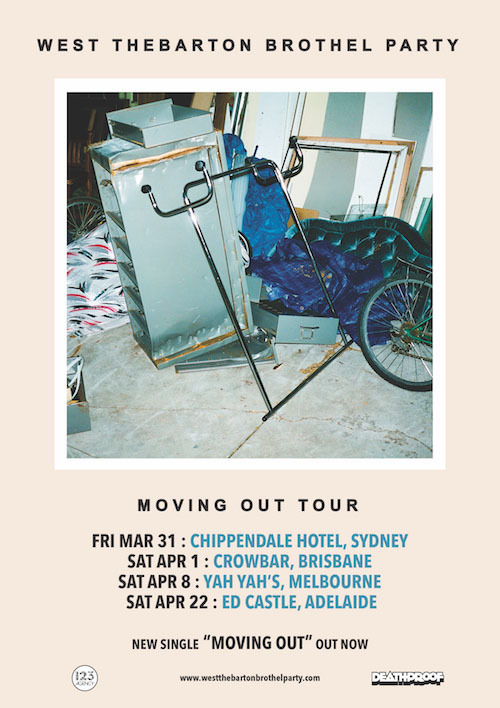 Of late these blokes are on a good wicket in the touring department, selling out their recent 7" headline tour, playing with fellow Adelaidians Bad//Dreems and sharing stages with Courtney Barnett, Cloud Nothings and King Gizzard. They dug deep with a memorable showing at BIGSOUND 2016, and landed an Unearthed slot at Groovin' the Moo. Produced by Dylan Adams (DMA’s, Sticky Fingers, The Vines), Moving Out is a charging coming-of-age ode to the peaks and pitfalls of sharehouse living. Marrying the explosive urgency of Eddy Current Suppression Ring and the ruthless growl of The Saints into something irresistible and distinct, it's been their smashing opening number since it was written. And it never fails to get tinnies and voices raised. A fuzzy maelstrom of four-guitar, balls-out rock music, mate. These guys are, like, really from Adelaide. We know. Not quite the buzzing musical metropolis. But WTBP's enthusiasm for all things South Australian, from Port Adelaide Football Club to South Australian landmarks (don’t mention Snowtown) is awe-inspiring. Coopers. The Exeter Hotel. The Great Australian Bight. You get the picture. Adelaide stuff. This allegiance saw ‘em nominated for a whopping SIX South Australian Music Awards last year, including Best Release and Best Song. They’re going on a big tour too. Go see 'em. And do not miss them at Gippsland's Hills Are Alive Festival. Do you have any idea how expensive it is to tour a seven-piece band?! See their appropriately titled Dolewave single for rumination on the banalities of that. Hear it. Feel it. Love it. West Thebarton Brothel Party = on.